Bees are amazing creatures. They’re social insects and communicate with each other in a way that seems almost impossible given their size. Humans and bees have evolved together over the centuries. Records of bee keeping can be found that date back to Egyptian times. While we value the honey they produce, the role they play as the primary pollinator of over 87 of the worlds most economically and gastronomically important crops is under threat. Can you imagine a world without bees? That world would also be without several other bee dependent crops including favorites like apples, blueberries, cherries, and onions just to name a few. So what is happening to the bees? 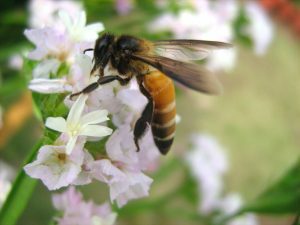 While bees have natural predators and disease such as Varroa mites and American Foulbrood that have attacked and killed weak hives, pesticides are now linked as one of the causes of Colony Collapse Disorder (CCD) in hives. CCD is a phenomenon that results in the sudden disappearance of worker bees resulting in the total collapse of a hive within a few weeks. The group of pesticides in question is the systemic pesticides. Systemic pesticides are administered to plants being attacked by piercing/sucking and chewing insects. The insecticide is watered into the plant and absorbed through the roots. The entire plant becomes toxic to insect pests. So how are the bees affected since they do not feed on plants? The toxins in these pesticides are in the pollen. It is important to remember that bees may visit a flower 10 times when it is in bloom. Nature has designed them that way to ensure successful pollination of the flower. While the lethal dose it takes to kill 50 percent of a test population may be low in a pesticide, repeated exposure increases the chance of the impact. Remember bees have hair on every part of their body, even their eyes just to collect as much pollen as possible. They may visit every flower on a plant ten times and there may be hundreds of flowers on a single plant. If all twenty thousand bees in a hive visit that treated plant’s flowers, they all will be exposed to the pesticide not once but ten times multiplied by the number of flowers on that plant. The result is dead worker bees. Without those worker bees, the hive will eventually die. So what can you do to help prevent the demise of the honeybee and potentially other pollinator populations? Look for alternative solutions for those pest problems. Ask yourselves, is this plant worth it? Can this problem be solved in a different way and why is this plant being attacked in the first place. Many times insect pests are just taking advantage of the situation. They tend to target stressed out plants. Those may be plants planted in the wrong place or at the wrong time, and stressed from the weather—too hot, cold, dry, or wet.